"Support your local Search and Rescue. Get Lost." GLAD YOU'RE BACK! I do hope that you had a really terrific vacation. I definitely qualify as a "True Adventurer" -- I take the living of life as a grand adventure. Don't forget to bring plenty of water! My vacay went off without a hitch. Saw family and indulged in much football. Certainly hope your T-Day went smoothly. Thanks for your patience. Missed you guys! Was it an adventure? And did you meet unknown fate? Or did you play it safe? Very laid back. I'd call it "soothing". 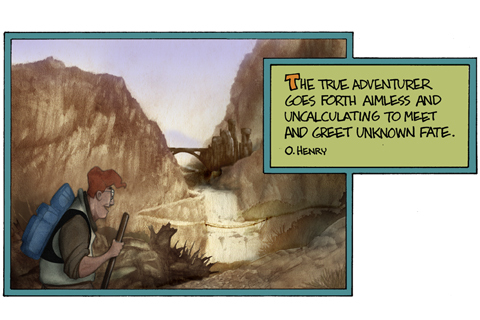 Is the adventure really aimless if it's fated? Hope everyone had a great holiday! Alaska is kool! Come on up for an adventure. Short days right now but it's not all that bad. This page contains a single entry from the blog posted on November 28, 2012 12:32 AM. The previous post in this blog was Good Reads I Like to Recommend...#8. The next post in this blog is 1981.